"Halo 1" redirects here. For the Nine Inch Nails song that uses this pseudonym, see Down in It. This article is about the sixth-generation Xbox video game. For enhanced remake on Xbox 360, see Halo: Combat Evolved Anniversary. Halo: Combat Evolved is a 2001 military science fiction first-person shooter video game developed by Bungie and published by Microsoft Game Studios. It was released as a launch title for Microsoft's Xbox video game console on November 15, 2001. Microsoft released versions of the game for Microsoft Windows and Mac OS X in 2003. The game was later released as a downloadable Xbox Original for the Xbox 360. Halo is set in the twenty-sixth century, with the player assuming the role of the Master Chief, a cybernetically enhanced supersoldier. The Chief is accompanied by Cortana, an artificial intelligence. Players battle various aliens as they attempt to uncover the secrets of the eponymous Halo, a ring-shaped artificial world. Bungie began development of what would eventually become Halo in 1997. Initially, the game was a real-time strategy game that morphed into a third-person shooter before becoming a first-person shooter. During development, Microsoft acquired the studio and turned the game into a launch title for its new video game console, the Xbox. Halo was a critical and commercial success. Halo has been praised as one of the greatest video games of all time. The game's popularity led to labels such as "Halo clone" and "Halo killer", applied to games either similar to or anticipated to be better than it. Halo spawned a multimedia franchise that has grossed more than $4.6 billion worldwide, incorporating games, books, toys, and films. In addition, the game inspired and was used in the fan-created Red vs. Blue video series, which is credited as the "first big success" of machinima (the technique of using real-time 3D engines, often from video games, to create animated films). More than five million copies were sold worldwide by November 2005. A high-definition remake, Halo: Combat Evolved Anniversary, was released for Xbox 360 on the 10th anniversary of the original game's launch. Anniversary was rereleased for Xbox One as part of Halo: The Master Chief Collection in 2014. The collection will be released for Windows in 2019. The Master Chief fires his assault rifle at a pack of enemy Grunts. Ammunition, health, and motion sensor displays are visible in the corners of the screen. 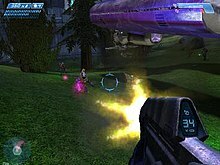 Halo: Combat Evolved is a shooter game in which players experience gameplay in a 3D environment almost entirely from a first-person view (FPS). The player can move around and look up, down, left, or right. The game features vehicles, ranging from armored jeeps and tanks to alien hovercraft and aircraft, many of which can be controlled by the player. The game switches to a third-person perspective during vehicle use for pilots and mounted gun operators; passengers maintain a first-person view. The game's heads-up display includes a "motion tracker" that registers moving allies, moving or firing enemies, and vehicles, in a certain radius of the player. The player character is equipped with an energy shield which nullifies damage from weapons fire and forceful impacts. The shield's charge appears as a blue bar in the corner of the game's heads-up display, and it automatically recharges if no damage is sustained for a brief period. When the shield is fully depleted, the player becomes highly vulnerable, and further damage reduces the hit points of a secondary health meter. When this health meter reaches zero, the character dies and the game reloads from a saved checkpoint. Health can be replenished through the collection of health packs scattered around the game's levels. Halo's arsenal consists of weapons from science fiction. The game has been praised for giving each weapon a unique purpose, thus making each useful in different scenarios. For example, plasma weapons need time to cool if fired too rapidly, but cannot be reloaded and must be discarded upon depletion of their batteries, whereas conventional firearms cannot overheat, but require reloading and ammunition. In contrast to the large weapon inventories of contemporary FPS games, Halo players may carry only two weapons at once, calling for strategy when managing firearms. Halo departs from traditional FPS conventions by not forcing the player character to holster its firearm before deploying grenades or melee-range blunt instruments; instead, both attacks can be utilized while a gun is still equipped, supplanting or supplementing small-arms fire. Like the game's other weapons, the two types of grenades differ; the fragmentation grenade bounces and detonates quickly, whereas the plasma grenade adheres to targets before exploding. The game's main enemy force is the Covenant, a group of alien species allied by belief in a common religion. Their forces include Elites, fierce warriors protected by recharging energy shields similar to the player's own; Grunts, which are short, cowardly creatures who are usually led by Elites in battle, and often flee in terror instead of fighting in the absence of a leading Elite; Jackals, originally space pirates, who wear a highly durable energy shield on one arm and a form of handgun on the other; and Hunters, large, powerful creatures composed of small worm-like colonies with thick armor plates that cover the majority of their bodies and a large assault cannon that fires explosive rounds of green plasma. A secondary enemy is the Flood, a parasitic alien life form that appears in several variants. Other enemies include Sentinels, aerial robots designed by an extinct race called the Forerunners to protect their structures and prevent Flood outbreaks. Sentinels are able to hover around in enclosed spaces and produce an energy shield when under attack. They lack durability, but use powerful laser beam weapons and are immune to infection by the Flood. The artificial intelligence in Halo has been favorably received. The player is often aided by United Nations Space Command (UNSC) Marines, who offer ground support, such as manning gun turrets or riding shotgun while the player is driving a vehicle. A split screen mode allows two players to cooperatively play through Halo's campaign. The game also includes five competitive multiplayer modes, which all can be customized, for between two and 16 players; up to four players may play split-screen on one Xbox, and further players can join using a "System Link" feature that allows up to four Xbox consoles to be connected together into a local area network. Halo lacks artificially intelligent game bots, and was released before the launch of the Xbox Live online multiplayer service; therefore LAN parties are needed to reach the game's 16-player limit, a setup that was a first for a console game, but was often deemed impractical by critics. Aside from this limitation, Halo's multiplayer components were generally well received by critics, and it is widely considered one of the best multiplayer games of all time. Although the Xbox version of Halo lacks official support for online multiplayer play, third-party packet tunneling software provide unofficial ways around this limitation. The Windows and Macintosh ports of Halo support online matches involving up to 16 players and include multiplayer maps not in the original Xbox release. However, co-operative play was removed from the ports because it would have required large amounts of recoding to implement. In April 2014, it was announced that GameSpy's servers and matchmaking, on which Halo PC relied, would be shut down by May 31 of the same year. A team of fans and Bungie employees announced they would produce a patch for the game to keep its multiplayer servers online. The patch was released on May 16, 2014. Halo: Combat Evolved takes place in a 26th-century science fiction setting. Faster-than-light travel called slipspace allows the human race to colonize planets other than Earth. The planet Reach serves as an interstellar naval yard and a hub of scientific and military activity. The United Nations Space Command (UNSC) develops a secret program to create augmented supersoldiers known as Spartans to quell rebellion in the human colonies. Twenty-seven years before the beginning of the game, a technologically advanced collective of alien races called the Covenant attack and destroy human worlds, declaring humanity an affront to their gods. Humanity's military experiences a series of crushing defeats; although the Spartans are effective against the Covenant, they are too few in number to turn the tide of the war. Two days before a Spartan mission to discover the location of the Covenant's homeworld, Covenant forces attack Reach and destroy the colony. The starship Pillar of Autumn escapes the planet with the Spartan Master Chief Petty Officer John-117 on board. The ship initiates a jump to slipspace, hoping to lead the enemy away from Earth. The game opens as Pillar of Autumn exits slipspace and discovers a large alien ringworld of unknown origin. The Covenant pursue Autumn and heavily damage the ship. Following protocol, Autumn's captain Jacob Keyes entrusts the ship's artificial intelligence (AI) Cortana to the Master Chief to prevent the Covenant from discovering the location of Earth. Chief, Cortana, and the ship's surviving crew escape to the ringworld's surface while Keyes crash-lands the ship on the ring. On the ground, Master Chief and Cortana rescue other survivors. Learning Keyes has been captured by the Covenant, Master Chief infiltrates the Covenant cruiser Truth and Reconciliation to rescue him. Keyes reveals the ringworld is called "Halo" by the Covenant, and they believe it to be a weapon. Intent on stopping the Covenant from using Halo, Master Chief and Cortana fight their way to the ring's control room, where Cortana enters Halo's computer systems. She sends Master Chief on an urgent mission to find and stop Keyes, who was looking for a supposed weapons cache. Reaching the captain's last location, Master Chief instead encounters a new enemy, a parasite known as the Flood. The release of the Flood prompts Halo's caretaker, the AI 343 Guilty Spark, to enlist Master Chief's help in activating the ring's defenses. After Master Chief retrieves the ring's activation index and prepares to use it, Cortana reappears. She has discovered that Halo is designed to wipe the galaxy of sentient life that the Flood use as hosts, thus starving and destroying the parasite. Defying 343 Guilty Spark, who sends his robotic Sentinels to stop them, Master Chief and Cortana decide to destroy Halo to prevent its activation or the escape of the Flood. Needing Keyes' command codes to destroy Autumn and Halo with it, Master Chief returns to Truth and Reconciliation, only to find Keyes assimilated by the Flood. Retrieving the codes from the captain's remains, Master Chief returns to Autumn, but the self-destruct sequence is stopped by 343 Guilty Spark. Instead, Master Chief and Cortana manually destabilize the ship's reactors, narrowly escaping the blast in another ship. In a post-credits scene, 343 Guilty Spark is shown to have survived Halo's destruction. In 1997, Bungie was a game development team of roughly 15 people working out of offices in south Chicago, Illinois. While the studio worked on Myth II: Soulblighter, a small group began work on a side project, originally envisioned as a science-fiction based real-time strategy game (RTS) with a strong focus on realistic physics simulations and three-dimensional terrain. Early versions of the game used the Myth engine and isometric perspective, with a science fiction wrapper. The project was called Monkey Nuts, then renamed Blam! when project lead Jason Jones could not bring himself to tell his mother the original name. In an effort to develop new ways of controlling units, Bungie added a mode that attached the game camera to individual units' perspectives. The vantage point continually got closer to the units as the developers realized it would be much more fun to experience the gameplay and drive the vehicles themselves than have the computer do it. "And controlling [the vehicle], just that double tactile nature of load a dude in, get a dude out, hands on the steering wheel—it was like, this shouldn't be an RTS game," Bungie founder Alex Seropian recalled. By mid-1998 the game had morphed into a third-person shooter. Peter Tamte, Bungie's then-executive vice president, used his contacts from his former position at Apple to get Joseph Staten and Jason Jones an audience with Apple Computer CEO Steve Jobs. Bungie's demo impressed Jobs, who agreed to debut the game to the world at the 1999 Macworld Conference & Expo. Anticipation built for the unknown Bungie game after favorable previews from industry journalists under non-disclosure agreements at Electronic Entertainment Expo 1999. Only days before the Macworld announcement, Blam! did not have a permanent title—possible names had included The Santa Machine, Solipsis, The Crystal Palace, Hard Vacuum, Star Maker, and Star Shield. Bungie hired a branding firm that came up with the name Covenant, but Bungie artist Paul Russell suggested a few alternatives, including Halo. Though some did not like the name—likening it to something religious or a women's shampoo—designer Marcus Lehto said, "it described enough about what our intent was for this universe in a way that created this sense of mystery." On July 21, 1999, during the Macworld Conference & Expo, Steve Jobs announced that Halo would be released for MacOS and Windows simultaneously. The first official screenshot of Halo. 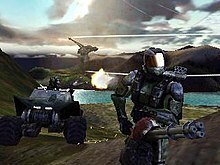 When Halo was shown at E3 in June 2000, it remained a third-person shooter. Story details were still developing. The premise involved a human transport starship that crashlands on a mysterious ringworld. Early versions of Covenant aliens appear in great numbers to loot what they can, and war erupts between them and the humans. Unable to match the technologically advanced alien race, the humans on the ringworld resort to guerrilla warfare. These early versions of the game featured Halo-specific fauna, which were later dropped because of design difficulties and the creatures' detraction from the surprise appearance of the Flood. Bungie's financial situation during Halo's development was precarious. Ahead of Myth II: Soulblighter's release, Bungie was surviving from its predecessor's sales, and had missed release dates. A glitch that caused the game to wipe the contents of the directory it was installed to was discovered only after 200,000 copies of the game had been produced for the December 1998 launch. Bungie decided to recall the copies and issue a fix, a choice which cost the company $800,000. As a result, Bungie sold a share of the company and publishing rights to Take-Two Interactive. Still facing financial difficulties, Bungie's executive vice president Peter Tamte contacted head of Microsoft Game Studios Ed Fries about a possible acquisition. Fries was working on developing the software lineup for Microsoft's first foray into game consoles, the Xbox. Microsoft was impressed with Halo and Bungie. Fries negotiated an agreement with Take-Two Interactive where Microsoft gained Bungie and the rights to Halo, while Take-Two kept Bungie's previous output. Jones and Seropian pitched the purchase to the rest of Bungie as way they could shape the future of a new game console. Microsoft announced its acquisition of Bungie on June 19, 2000. Halo was now to be the tentpole launch title for the Xbox. In less than a year, Bungie had to turn Halo from a loose collection of ideas into a shipping product. To make players feel more connected to the action, Jason Jones pushed for turning the game's perspective from third-person to first-person. A key concern was making sure the game played well on the Xbox's gamepad—at the time, first-person shooters on consoles were still rare. Designer Jaime Griesemer spearheaded the effort to adapt Halo to the gamepad. Griesemer worked on code that tried to discern player intent and assist the player's movement and aiming without being obvious. The game buffered player inputs so that the end result was the desired player movement, but not necessarily the one players were making. Other Bungie projects were scrapped, and their teams absorbed into Halo in the dash to ship. Griesemer recalls that after the Bungie team moved to Microsoft's campus in Redmond, Washington, he was so busy he did not unpack his belongings for six months. It became clear that the lengthy planned campaign was not feasible. Bungie made several cuts, with Staten describing his role as putting "story duct tape" over the gaps that remained. To save time, Lehto floated the idea of reusing campaign levels; glowing directional arrows were added after playtesters got lost. The game's campaign cutscenes came in so late that O'Donnell had to score all of them in only three days. Originally a key element, the game's online multiplayer component was dropped because Xbox Live would be unfinished at the time of Halo's release. Only four months before the game's release, Griesemer recalled that the multiplayer was still not very fun, so it was scrapped and rebuilt from scratch. The UNSC's curved look was made blockier to distinguish it from the Covenant, as was the choice for humanity 500 years in the future to still be using projectile weapons—because the Covenant used lasers. Composer Martin O'Donnell and his company TotalAudio were tasked with creating the music for Halo's MacWorld debut. Staten told O'Donnell that the music should give a feeling of mystery and 'ancient'. O'Donnell decided gregorian chant fit the bill, and performed the vocals alongside his composing partner Michael Salvatori and additional singers. Because he did not know how long the presentation would be, O'Donnell created "smushy" opening and closing sections that could be expanded or cut as time required to back up a rhythmic middle section. The music was recorded and sent to New York for the show the same night the piece was finished. Shortly before Bungie was bought by Microsoft, O'Donnell joined Bungie as a staff member, while Salvatori remained at TotalAudio. He designed the music so that it "could be dissembled and remixed in such a way that would give [him] multiple, interchangeable loops that could be randomly recombined in order to keep the piece interesting as well as a variable length." Development involved the creation of "alternative middle sections that could be transitioned to if the game called for such a change (i.e. less or more intense)." O'Donnell has remarked that he "sat with the level designers and 'spotted' the level as though it was a movie, with the knowledge that the music would have to be malleable rather than static.... [T]he level designer would tell me what he hoped a player would feel at certain points or after accomplishing certain tasks." Based on this information, O'Donnell would "go back and develop appropriate music cues, then have the designer script the cues into the level, and then we'd play through it to see if it worked as desired." He explained that the use of music in Halo is sparse because he believes that "[music] is best used in a game to quicken the emotional state of the player and it works best when used least," and that "[if] music is constantly playing it tends to become sonic wallpaper and loses its impact when it is needed to truly enhance some dramatic component of game play." Ed Fries described the period before the Xbox's launch as chaotic; "You’ve got to imagine this environment of panic combined with adrenaline, but money’s mostly no object at the same time. So we were spending lots of it, trying to do all this crazy stuff," he recalled. several planned video game tie-ins to Steven Spielberg's film A.I. Artificial Intelligence were scrapped, and it became clear that Halo had to be the Xbox's tentpole title. While a playable demonstration of the game at Gamestock 2001 was well-received, critics had mixed reactions to its exhibition at E3 2001. The game was released in North America simultaneously with the Xbox, on November 15, 2001. After Bungie refused to change the Halo name to appease marketing research teams, the subtitle "Combat Evolved" was added to make it more descriptive and compete better with other military-themed games. The story surrounding Halo: Combat Evolved has been adapted into novels, the first of which was Halo: The Fall of Reach, a prequel. Published in October 2001, this novel was written by Eric Nylund, who reportedly completed it in seven weeks. The novel became a Publishers Weekly bestseller with almost two hundred thousand copies sold. The following novel, entitled Halo: The Flood, is a tie-in to Halo: Combat Evolved, describing not only the experiences of the Master Chief, but also those of other characters on Installation 04. Written by William C. Dietz, this novel appeared on the Publishers Weekly bestsellers list during May 2003. On July 12, 2002, a Halo port for Windows was announced to be under development by Gearbox Software. Its showing at E3 2003 was positively received by some critics, with skepticism by others. It was released on September 30, 2003, and included support for online multiplayer play and featured sharper graphics, but had compatibility issues that caused poor performance. Halo was later released for Mac OS X on December 11, 2003. On December 4, 2007, the game became available for the Xbox 360 via download from the Xbox Live Marketplace. While Halo was not an instant success on release, it had a long tail sales rate and a very high attach rate for the Xbox. By April 2002, roughly five months after its release, one million units had been sold: this pace was faster than that of any previous sixth-generation console game. During the two months following Halo's release, the game sold alongside more than fifty percent of Xbox consoles. By July 14, 2003, the game had sold three million copies worldwide, and by January 28, 2004, it had reached four million copies. As of November 9, 2005, Halo has sold over five million copies worldwide. By July 2006, its Xbox version had sold 4.2 million copies and earned $170 million in the United States alone. Next Generation ranked it as the second highest-selling game launched for the PlayStation 2, Xbox or GameCube between January 2000 and July 2006 in that country. Its computer version sold 670,000 copies and earned $22.2 million in the United States by August 2006. Halo received "universal acclaim", according to review aggregator Metacritic, based on reviews from 68 professional critics. Ste Curran's review for Edge praised the game as "the most important launch game for any console, ever" and commented, "GoldenEye was the standard for multiplayer console combat. It has been surpassed." GameSpot claimed that "Halo's single-player game is worth picking up an Xbox for alone," concluding, "Not only is this easily the best of the Xbox launch games, but it's easily one of the best shooters ever, on any platform." IGN remarked similarly, calling Halo a "can't miss, no-brainer, sure thing, five star, triple A game." AllGame editor Jonathan Licata praised Bungie for doing "a remarkable job with Halo, taking many successful elements from previous standouts in the genre to make one very playable game". Among the specific aspects that reviewers praised were the balance of weapons, the role of drivable vehicles, and the artificial intelligence of enemies. The game received numerous Game of the Year awards, including those of the Academy of Interactive Arts & Sciences, Electronic Gaming Monthly, Edge, and IGN. The British Academy of Film and Television Arts awarded Halo "Best Console Game," and Rolling Stone presented it with their "Best Original Soundtrack" award. According to Xbox.com, the game received a total of 48 awards. Although Halo's overall reception was largely positive, the game received criticism for its level design. GameSpy commented, "you'll trudge through countless hallways and control rooms that all look exactly the same, fighting identical-looking groups of enemies over and over and over...it is simply frustrating to see a game with such groundbreaking sequences too often degenerate [into] this kind of mindless, repetitive action." Similarly, an article on Game Studies.org remarked, "In the latter part of the game, the scenarios rely on repetition and quantity rather than innovativeness and quality." Eurogamer concluded, "Halo is very much a game of two halves. The first half is fast, exciting, beautifully designed and constantly full of surprises. The second half is festooned with gobsmacking plot twists and great cinematics but let down by repetitive paint by numbers level design." Halo was released prior to the launch of Xbox Live, and the lack of both online multiplayer and bots to simulate human players was criticised by GameSpy; in 2003 GameSpy included Halo in a list of "Top 25 Most Overrated Games of All Time." Halo's PC port received generally favorable reviews, garnering a score of 83% on Metacritic. GameSpot stated that it was "still an incredible action game ... [and] a true classic," awarding it 9.0 out of 10. It received a score of 8.2 out of 10 from IGN, who stated, "If you've played the game on the Xbox, there's not much for you here." Eurogamer called the game "a missed opportunity," but stated that the online multiplayer component was "a massive draw ... for Halo veterans." Halo has been praised as one of the greatest video games of all time, and was ranked by IGN as the fourth-best first-person shooter made. The game's popularity led to labels such as "Halo clone" and "Halo killer", applied to games either similar to or anticipated to be better than it. According to GameSpot, Halo's "numerous subtle innovations have been borrowed by countless other games since." The game is often cited as the main reason for the Xbox's success, and it began what is commonly regarded as the system's flagship franchise. Game designer Vox Day credited the game with using science-fiction environments to follow Half-Life in eschewing static levels and a similarity to dungeon crawls, which the FPS genre inherited from Akalabeth. Day further wrote that Halo spurred a sustained trend of many other FPS console games. 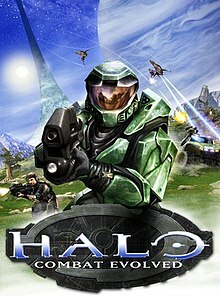 In July 2006, Next-Gen.biz published an article estimating Halo as the second-highest revenue-generating 21st century console video game in the United States, behind Grand Theft Auto: Vice City. The game's popularity sparked the usage of terms like "Halo clone" and "Halo killer." The Halo engine has been used for the game Stubbs the Zombie in Rebel Without a Pulse. Halo has been featured at both Major League Gaming and the World Cyber Games. In machinima, the game was used as the basis for the popular web series Red vs. Blue. The game's sequel, Halo 2, made US$125 million with unit sales of 2.38 million on the first day of its release, earning it the distinction of the fastest-selling United States media product in history. Three years later, Halo 3 shattered that record with the biggest opening day in entertainment history, taking in US$170 million in its first 24 hours. Halo modernized the FPS genre. On March 15, 2004, Gearbox Software released Halo: Custom Edition for Windows, which enabled players to use custom-made maps and game modifications via the Halo Editing Kit developed by Bungie. Halo: Custom Edition is multiplayer-only, and requires an original copy of Halo for PC to install. During the Microsoft press conference at the 2011 E3 Expo, it was revealed that Halo: Combat Evolved would be remade by 343 Industries with an in-house game engine and would include achievements, Terminals, and Skulls. It was released for the Xbox 360 on November 15, 2011. The release date marks the 10th anniversary of the original game's release. The remastered version of the original game includes online multiplayer and cooperative play functionality. The remake is also the first Halo game to include Kinect support. The game is a mix of two game engines—the original Halo engine created by Bungie which provides gameplay and a new engine created by 343 and Saber which is responsible for improved graphics—and the player is able to switch between the improved and classic modes of the game at any time. The game's multiplayer component uses the Halo: Reach gameplay engine, tailored with a map playlist to mimic the original multiplayer, as opposed to including the original game's multiplayer mode. The Anniversary version of the game is the version contained in The Master Chief Collection for Xbox One. The single-player game is identical to the Xbox 360 version, including the ability to swap between the updated "anniversary" graphics and the original game graphics. However, unlike the Xbox 360 release, the multiplayer component is the original multiplayer engine from Combat Evolved as opposed to Halo: Reach and is playable over Xbox Live, something not possible until The Master Chief Collection. ^ Additional work on the Windows and Mac versions were done by Gearbox Software and Westlake Interactive. ^ "Xbox Goes Global With European and Australian Launches". news.microsoft.com. Microsoft. March 14, 2002. Archived from the original on May 20, 2015. Retrieved May 20, 2015. ^ a b c d "Halo: Combat Evolved for Xbox Reviews". Metacritic. CBS Interactive. Archived from the original on May 20, 2015. Retrieved June 22, 2011. ^ "Halo: Combat Evolved Product Details". amazon.co.uk. Retrieved November 21, 2015. ^ a b c d "Halo: Combat Evolved for PC Reviews". Metacritic. CBS Interactive. Archived from the original on May 20, 2015. Retrieved August 22, 2006. ^ a b c d "Halo: Combat Evolved Macintosh". GameSpot. Archived from the original on October 20, 2006. Retrieved August 22, 2006. ^ Ahearn, Nate (November 30, 2007). "Fall Update Details". IGN. Ziff Davis. p. 1. Archived from the original on May 20, 2015. Retrieved May 20, 2015. ^ Tavares, José Pedro; Gil, Rui; Roque, Licino (April 15, 2005). "Player as Author: conjecturing online game creation modalities and infrastructure". Archived from the original (PDF) on May 21, 2015. Retrieved May 21, 2015. ^ a b O'Connor, Frank (November 9, 2005). "Halo 2: One Year Later". Bungie. Archived from the original on May 20, 2015. Retrieved December 3, 2007. ^ Yin-Poole, Wesley (June 12, 2014). "Halo: The Master Chief Collection is pure fan service". Eurogamer. Gamer Network. Archived from the original on May 20, 2015. Retrieved May 20, 2015. ^ Polygon (March 12, 2019). "Halo: The Master Chief Collection coming to PC". Retrieved March 23, 2019. ^ a b c "Frequently Asked Questions about Halo: Gameplay". Halo.Bungie.Org. Archived from the original on August 3, 2002. Retrieved September 6, 2006. ^ a b c d e Boulding, Aaron (November 9, 2001). "Halo Review". IGN. Ziff Davis. p. 1. Archived from the original on May 20, 2015. Retrieved May 20, 2015. ^ a b c d e Bungie, ed. (2001). Halo: Combat Evolved Instruction Manual (PDF). Microsoft Game Studios. ^ a b c d Accardo, Sal (November 15, 2001). "Gamespy: Halo". GameSpy. Ziff Davis. p. 1. Archived from the original on May 20, 2015. Retrieved July 25, 2012. ^ a b c d e Fielder, Joe (November 9, 2001). "Halo: Combat Evolved Xbox Review". GameSpot. Retrieved January 19, 2014. ^ a b c d e "Halo: Combat Evolved review". Edge. Future Publishing (105). November 29, 2001. Archived from the original on October 14, 2014. ^ "Human Weapons Intro". Bungie. Archived from the original on October 28, 2004. Retrieved September 8, 2006. ^ "Covenant Weapons Intro". Bungie. Archived from the original on October 28, 2004. Retrieved September 8, 2006. ^ "Halo Game Guide - The Covenant". GameSpot. October 17, 2003. p. 34. Archived from the original on September 29, 2007. Retrieved September 8, 2006. ^ a b "Halo Game Guide - The Flood". GameSpot. October 17, 2003. p. 36. Archived from the original on September 26, 2007. Retrieved September 8, 2006. ^ Soboleski, Brent (November 9, 2001). "Halo Review (Xbox)". TeamXbox. Archived from the original on March 28, 2006. Retrieved September 2, 2006. ^ "Halo : FAQInfo : FAQs". Bungie. Archived from the original on April 27, 2006. Retrieved September 7, 2006. ^ Sanders, Shawn (November 1, 2001). "Halo: Combat Evolved review for the XBOX". Game Revolution. Retrieved September 2, 2006. ^ a b "Top 25 Most Overrated Games of All Time". GameSpy. September 15, 2003. Archived from the original on June 22, 2006. Retrieved June 26, 2006. ^ a b c Butts, Steve (September 27, 2003). "Halo: Combat Evolved Review - PC Review". IGN. Retrieved September 7, 2006. ^ a b Reed, Kristan (October 10, 2003). "Halo: Combat Evolved Review - PC". Eurogamer. Retrieved September 7, 2006. ^ Dyer, Mitch (April 3, 2014). "GAMESPY MULTIPLAYER SHUTTING DOWN, HUNDREDS OF GAMES AT RISK". IGN. Ziff Davis. Retrieved May 12, 2014. ^ Miller, Arthur (May 12, 2014). "Home News Halo: Combat Evolved PC Bungie to update Halo PC with server fix". Eurogamer. Gamer Network. Retrieved May 12, 2014. ^ O'Connor, Alice (May 19, 2014). "Is It Bungie You're Looking For? Halo Patch Drops GameSpy". Rock, Paper, Shotgun. Archived from the original on May 19, 2014. Retrieved May 19, 2014. ^ a b c d e f g h i j k l m n o p Haske, Steven (May 30, 2017). "The Complete, Untold History of Halo". Vice. Vice Media. Archived from the original on March 15, 2018. Retrieved March 27, 2018. ^ "Inside Bungie: History". Bungie. Archived from the original on October 12, 2004. Retrieved June 19, 2006. ^ Trautmann, Eric (2004). The Art of Halo. New York: Del Ray Publishing. p. ix. ISBN 0-345-47586-0. ^ Xbox World 360 (October 8, 2007). "The History of Halo; How two students went from Pong clones to the biggest game of all time". GamesRadar. pp. 1–4. Archived from the original on November 23, 2008. Retrieved October 9, 2009. ^ a b Lopez, Vincent (July 21, 1999). "Heavenly Halo Announced from Bungie". IGN. Retrieved August 31, 2006. ^ Morris, Daniel (October 1999). "Your first look at... Halo". PC Gamer: 40. ^ a b Castle, Matthew, ed. (2015). Golden Joystick Presents... Halo (PDF). Future Publishing. ^ Hiatt, Jesse (November 1999). "Games That Will Change Gaming". Computer Gaming World. Retrieved August 31, 2006. ^ "One Million Years B.X. (Before Xbox)". Bungie. April 9, 2004. Archived from the original on October 11, 2004. Retrieved September 7, 2006. ^ Mahin, Bill (March 23, 2000). "Monsters in a Box". Chicago Reader. Archived from the original on September 23, 2015. Retrieved March 19, 2016. ^ "Microsoft to Acquire Bungie Software". Microsoft. June 19, 2000. Archived from the original on May 1, 2006. Retrieved August 22, 2006. ^ Staff (February 2002). "Afterthoughts: Halo". Electronic Gaming Monthly. No. 151. pp. 52–54. ISSN 1058-918X. ^ "Just the Right Sense of "Ancient"". Xbox.com. Microsoft. Archived from the original on March 1, 2007. Retrieved September 6, 2006. ^ Amrich, Dan; Ryan McCaffrey (September 25, 2009). "KOXM Episode 183". Official Xbox Magazine. Archived from the original on October 1, 2009. Retrieved September 28, 2009. —interview segment from 0:22:15–1:02:00. ^ "TotalAudio Questions & Answers". Halo.Bungie.Org. Retrieved January 30, 2008. ^ a b Marks, Aaron (December 2, 2002). "The Use and Effectiveness of Audio in Halo: Game Music Evolved". Music4Games. Archived from the original on June 19, 2006. Retrieved September 6, 2006. ^ O'Donnell, Martin (March 24, 2002). "Producing Audio for Halo". Halo.Bungie.Org. Retrieved September 6, 2006. ^ Lopez, Vincent (March 4, 2001). "Playable Halo at GameStock". IGN. Retrieved September 5, 2006. ^ Toyama, Kevin (May 2001). "Holy Halo". Next Generation Magazine: 1. ^ Wojnarowicz, Jakub; Colayco, Bob (May 18, 2001). "2001 E3 Part 1". FiringSquad. Archived from the original on October 16, 2006. Retrieved September 5, 2006. ^ Nihei, Wes (May 1999). "A World Apart". GamePro: 42. ^ Mott, Tony, ed. (2010). "2001: A Space Odyssey". Edge (215): 86. Jaime Griesemer: At the time, Microsoft marketing thought Halo was not a good name for a videogame brand. It wasn't descriptive like all the military games we were competing with. We told them Halo was the name. The compromise was they could add a subtitle. Everyone at Bungie hated it. But it turned out to be a very sticky label and has now entered the gaming lexicon... so I guess in hindsight it was a good compromise. But the real name of the game is just Halo. ^ Longdale, Holly. "Game Worlds in Written Words". Xbox.com. Microsoft. Archived from the original on February 28, 2007. Retrieved September 2, 2006. ^ Greene, Marty. "First Strike Author Eric Nylund Q&A". Xbox.com. Microsoft. Archived from the original on August 21, 2006. Retrieved September 2, 2006. ^ Klepek, Patrick (May 5, 2003). "Halo novel cracks bestseller". Gaming-Age. Archived from the original on April 26, 2005. Retrieved September 2, 2006. ^ "Halo Officially Official for the PC!". IGN. July 12, 2002. Retrieved September 20, 2006. ^ Accardo, Sal (May 13, 2003). "Halo: Combat Evolved: The Very First Look". GameSpy. Retrieved September 20, 2006. ^ Parker, Sam (May 15, 2003). "Halo PC Hands-On". GameSpot. Archived from the original on September 28, 2006. Retrieved September 20, 2006. ^ Sulic, Ivan (May 16, 2003). "E3 2003: Halo Hands-On". IGN. Retrieved September 20, 2006. ^ a b Kasavin, Greg (September 29, 2003). "Halo: Combat Evolved PC Review". GameSpot. Archived from the original on October 23, 2006. Retrieved September 7, 2006. ^ Purchese, Rob (November 13, 2007). "Autumn 360 update dated". Eurogamer. Retrieved November 15, 2007. ^ "Halo: Combat Evolved for Xbox Tops 1 Million Mark In Record Time". Microsoft. April 8, 2002. Archived from the original on January 6, 2008. Retrieved September 1, 2006. ^ Patrizio, Andy (January 9, 2002). "Xbox Assault Only Starting". Wired. Archived from the original on December 16, 2008. Retrieved September 27, 2006. ^ Parker, Sam (July 14, 2003). "Halo reaches 3 million". GameSpot. Archived from the original on September 29, 2007. Retrieved September 1, 2006. ^ "Halo Sells Over Four Million for Xbox". GamePro. January 28, 2004. Archived from the original on December 6, 2008. Retrieved September 1, 2006. ^ Campbell, Colin; Keiser, Joe (July 29, 2006). "The Top 100 Games of the 21st Century". Next Generation. Archived from the original on October 28, 2007. ^ a b Licata, Jonathan. "Halo: Combat Evolved - Review". AllGame. Archived from the original on November 14, 2014. Retrieved April 6, 2017. ^ a b Bye, John (March 13, 2002). "Halo Review". Eurogamer. Gamer Network. Archived from the original on May 21, 2015. Retrieved December 3, 2011. ^ McNamara, Andy. "Halo: The Xbox Essential". Game Informer. Archived from the original on October 11, 2007. Retrieved September 26, 2006. ^ "2002 5th Annual Interactive Achievement Awards". The Academy of Interactive Arts & Sciences. February 28, 2002. Retrieved September 1, 2006. ^ a b "Halo: Combat Evolved - Awards". Xbox.com. Microsoft. Archived from the original on December 10, 2006. Retrieved September 1, 2006. ^ Järvinen, Aki (July 2002). "Halo and the Anatomy of the FPS". Game Studies. 2 (1). Retrieved September 4, 2006. ^ "Edge's Top 100 games of all time". Edge. Future Publishing. July 2, 2007. p. 10. Archived from the original on October 18, 2012. Retrieved September 28, 2012. ^ "The 52 Most Important Video Games of All Time". GamePro. April 25, 2007. Archived from the original on May 20, 2007. Retrieved September 3, 2007. ^ "Halo: Combat Evolved -#4 Top Shooters". IGN. Ziff Davis. September 13, 2013. p. 4. Archived from the original on May 21, 2015. Retrieved February 23, 2014. ^ Ransom-Wiley, James (January 23, 2006). "Joystiq Interview: Peter Moore @ CES". Joystiq. AOL. Archived from the original on January 28, 2015. Retrieved September 7, 2006. ^ a b Tuttle, Will (November 2, 2004). "Gamespy: Killzone". GameSpy. Ziff Davis. p. 1. Archived from the original on May 9, 2015. Retrieved October 14, 2007. Will Tuttle: "So it was with great disappointment that I finished my review copy of Sony's Killzone, a game that was at one time unfairly labeled a "Halo killer" by some members of the gaming press. ^ "Best Launch Titles". GameSpot. Archived from the original on December 21, 2005. Retrieved September 7, 2006. ^ Hill, Jason (November 4, 2004). "Xbox wears a Halo of success". The Age. Retrieved September 19, 2006. ^ "Xbox 360 games we can't wait to play". CNET. August 2, 2006. Archived from the original on August 23, 2007. Retrieved September 7, 2006. ^ Day, Vox (2006). "Halo and the High Art of Games". In Yeffeth, Glenn (ed.). Halo Effect: An Unauthorized Look at the Most Successful Video Game of All Time. Dallas, Texas: BenBella Books. pp. 160–161. ^ Campbell, Colin; Keiser, Joe (July 29, 2006). "The Top 100 Games of the 21st Century". Next-Gen.biz. Future US. p. 11. Retrieved December 3, 2011. ^ Howarth, Robert (May 20, 2006). "VE3D Best of E3 2006 Awards". Voodoo Extreme. IGN. Archived from the original on August 15, 2007. Retrieved September 7, 2006. ^ Bedigian, Louis (May 28, 2003). "Brute Force - XB - Review". GameZone. Archived from the original on October 11, 2007. Retrieved September 7, 2006. ^ Gibson, Ellie (November 14, 2005). "Rare on Revolution controller". Eurogamer. Retrieved September 7, 2006. ^ Van Autrijve, Rainier (October 29, 2004). "Rebel Without a Pulse Announced". GameSpy. Archived from the original on May 7, 2006. Retrieved September 7, 2006. ^ Olsen, Jennifer (October 7, 2004). "The pomp before the stomp: The World Cyber Games kicks off". GameSpot. Archived from the original on September 30, 2007. Retrieved September 7, 2006. ^ Calvert, Justin (September 10, 2003). "$10,000 in prize money for first MLG event". GameSpot. Retrieved September 7, 2006. ^ "'Halo 2' reports $125 million in first-day sales". MSNBC. November 10, 2004. Retrieved September 7, 2006. ^ Fahey, Rob (November 11, 2004). "Halo 2 US sales top $125 million; UK retail celebrates successful launch". GamesIndustry.biz. Eurogamer. Retrieved September 7, 2006. ^ Snow, Blake (September 26, 2007). "Halo 3 shatters retail record; sells $170M in 24 hrs". GamePro. Archived from the original on December 6, 2008. Retrieved September 27, 2007. ^ Staff (March 23, 2015). "The Making of Halo: Combat Evolved". Retro Gamer. Imagine Publishing. Archived from the original on May 30, 2016. Retrieved January 2, 2019. ^ a b "Halo: Custom Edition - PC". IGN. Retrieved September 2, 2006. ^ Davison, Pete (June 6, 2011). "E3: Halo Anniversary Coming November 15". GamePro. Archived from the original on November 30, 2011. Retrieved June 6, 2011. ^ Snider, Mike (June 7, 2011). "At E3: Something old, new for 'Halo' gamers". USA Today. Retrieved June 8, 2011. ^ Pakinkis, Tom (June 20, 2011). "Halo: CE Anniversary has Kinect support". CVG. Retrieved June 20, 2011. ^ Hillier, Brenna (June 10, 2011). "Halo Anniversary to run two engines side by side". VG247. Retrieved August 23, 2011.